Imagine trains that travel 200 miles per hour between Chicago and St. Louis, drastically cutting the travel time for that trip. It’s not far-fetched. In fact, it’s happening in other places. But in Illinois, high speed rail has been more about baby steps than giant leaps. Rick Harnish is Executive Director of the Midwest High Speed Rail Association. He’s lobbied for more investment in rail. “There is a very high level of interest, especially among companies that go to China and see high speed rails and wonder why can’t we have that here,” he said. You have probably seen work taking place on the Chicago to St. Louis Corridor with updated crossings and other improvements. He admits this will be a change for the better, though not transformational. He wants to see Chicago to Springfield train travel done in half the time. He wants the trains traveling on their own tracks, not sharing with freight carriers which often results in delays. Harnish adds the new and faster trains are upgraded for both modern convenience and safety. So what’s the hold up? Money. A major investment would be needed, possibly a mix of funding from both public and private partners. Credit Midwest High Speed Rail Assoc. One estimate places the cost of a Midwest system to also serve Indianapolis at $30 billion. Harnish said that number is on the high end. He also said the system could be built in segments, rather than all at once. 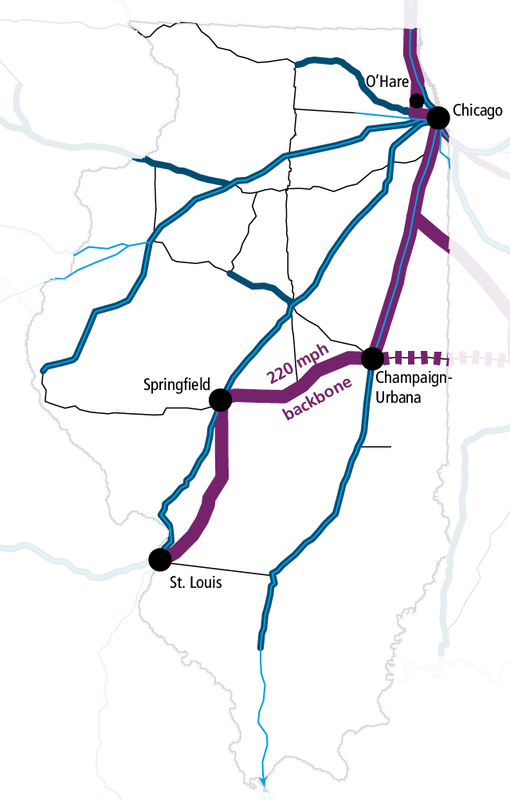 The higher speed route would serve O’Hare International Airport, south to Champaign-Urbana, then follow along I-72 to Decatur and Springfield, before connecting to the St. Louis area. Other tracks could connect and serve additional towns like Bloomington, Peoria and Carbondale. Bus routes could also expand. Harnish said that could help not just with recreational travel, but also helping bring more jobs because make other areas of Illinois easier to access and more attractive. He said it’s time to think more broadly about transportation networking. “When we travel by car, we think only about our destination. We don’t think about how other cars are coming and going from other locations. You might only be taking the train from St. Louis to Springfield, but others would go much farther,” Harnish said.